The Sniper the new release from SCELERATA is finally available today via Nightmare Records. The Sniper presents a stunning vocal performance from Fabio Juan, showing a more mature band that delivers a heavier more aggressive sound, beautifully mixing power metal and melodic progressive elements ranging from angst ridden lyrics of corruption to sorrowful love lost. The huge and intricate production makes this album a must hear for any true metal fan. 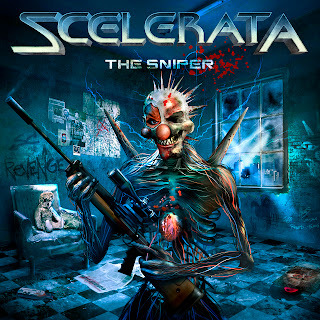 In conjunction with the album's release, SCELERATA has teamed up with GuitarWorld.com the online home of Guitar World Magazine for an exclusive full album stream of The Sniper. The Sniper was produced, mixed and mastered by Charlie Bauerfeind with guitarist Renato Osorio. The album also features Andi Deris (Helloween) and Paul Di'Anno (ex-Iron Maiden) as very special guests, who not only sing but helped compose and co-write the songs. The Sniper can be ordered via the Nightmare Records Website, Amazon and iTunes.